lostlabyrinth.com • View topic - How to overcome level which needs 2xPortal? Post subject: How to overcome level which needs 2xPortal? First of all congratulations on developing this awesome game. I am attaching the save folder of my current most succesful game ever. Level 16, which I guess is not much impressive for the veterans here. My problem is that I have reached a level where the exit is beyond walls. I could reach it if I could cast Portal twice, but that is not possible. I guess there may be other ways to get past it like "Alternate time-line" but I don't have time magic and even if I had my spell circle is only level 13. I don't know if this is intended. If it is it seems a bit too harsh, even for lostlaby. This is a level where the majority of builds will have to give up and does not comply with the phrase I've read about "The basic laby challenges are light, food, water, traps and monsters." Maybe this is not a basic but an advanced challenge though. This was under gentoo linux 32 bits. laby_5.0.0. 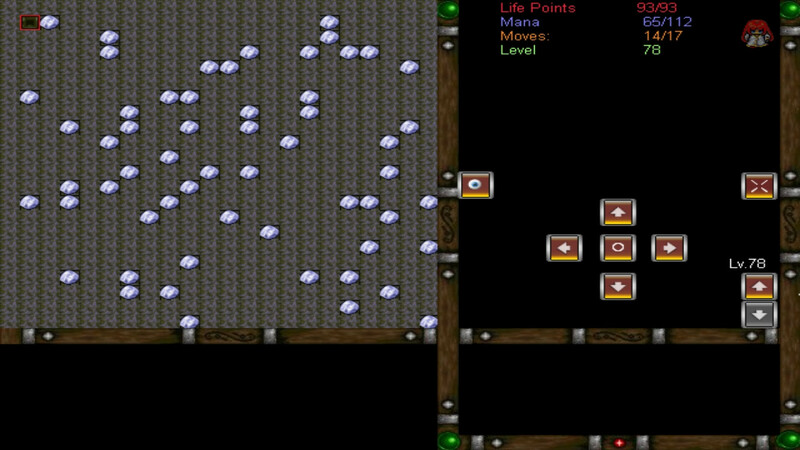 Here is a screenshot of the troublesome level. I am near of the downstairs and I have already used my portal, used it on the square I am standing on right now. Post subject: Re: How to overcome level which needs 2xPortal? Really, until this bug gets fixed, I'm taking a break from LL. My no magic builds would be just as screwed by these layouts, and I don't see an easy way around it. They happened about 4-5 times during my 150 floor run. I finally was able to find and fix this bug. We'll try to get a new release out soon. Well, Markus always said our players are better at laby than us devs. I plan to make counterspell work depending on the strength you casted it compared to the monster's power. So only spells weaker than counterspell's own power will get a good chance of getting repelled. I particularly dislike how it completely negates magic vulnerability. The only unloaded information exceeding what you see on the highscore page anyway are the player's status values: str.,dex, etc. I have made it so, that invisibility is disrupted on the turn you cast a spell attack. So monsters can see and target you normally. Before, you could cast spells and also shoot arrows without getting noticed while close combat would even end the spell. Furthermore, I made invisibility effect exclusive with "illusion" because creating false images of oneself you can't be invisible. Unless you cast invisible illusions which then would not work obviously. Ideally, I'd like to give the monsters different stats about how good they are detecting you by sight,sound or smell. The first may get hindered by invisibility of course; while sneaking should help mostly with the second. It might also be plausible that some enemies have the spell "see invisible" running or an innate ability to that end. Syphon got reduced to 1/4 mana saved. That way it is not a replacement at all for ancient magic. Syphon only works with spells costing 4 or more while ancient is especially useful for spells with low costs. And with "devs" I meant laby devs specifically, not programmers as a whole. Kinda like one can't proofread own texts properly - being blind to errors, always reading what we meant and not what we actually wrote. 1 in 5 levels after 10 is selected from the special types. Of those, one in 12 is the broken one. So on average only every 60th level is from the broken algorithm. If you are lucky you can still reach the exit, which will always be at top left corner. Of course, traversing all 150 levels, there is a good chance then to encounter this problem.